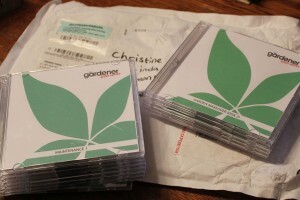 Today my eagerly awaited purchase of the DVD Series of the popular show, ‘The Gardener’, arrived in the mail! ‘The Gardener’ is South Africa’s favourite’s gardening magazine whose live-wire editor is inimitable Tanya Visser (see photo below). Tanya presents a weekly Television Series on the South African Home Channel called (you guessed it! ), ‘The Gardener’. Each week Tanya presents a topical gardening subject ranging from laying your own lawn, pruning roses to complete garden make-overs. 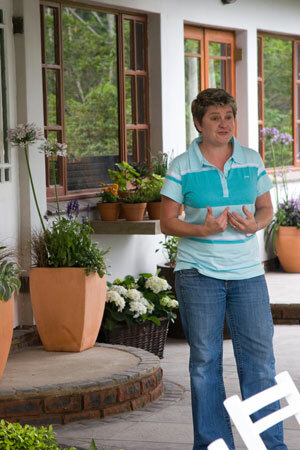 She presents some beautiful gardens around South Africa with a brilliant variety of design styles and plant selections to inspire anyone to get stuck into their own garden. Each show offers practical gardening tips (essential viewing for a gardening-newbie like myself) as well as DIY projects, practical demonstrations from experts and a whole lot more. So far I’ve watched the first disc on ‘Maintenance’ (see below). I’ve learnt how to maintain edging around beds and paving, how to care for and prune roses correctly from South Africa’s best known rose expert, Ludwig Tascher and I’ve learnt the ins and outs of looking after my lawn. I picked up some valuable tips on correct usage of my automated irrigation system and finally, I’ve seen how to lay instant lawn. Once I’ve watched the next disc I will hopefully know how to control weeds in lawn, fertilizing and feeding lawn and dealing with shady areas as well as preparing soil, planting filler plants in dead or thin areas and feeding plants and then, once again they cover roses. This time its looking after roses – preventing pests and controlling weeds. There are three discs that cover Garden Makeovers, two discs dedicated to Watter Features, two discs on Container Gardening and three discs that cover Growing. The three maintenance discs cover various aspects of maintaining and improving your garden and finally, the last two discs are all about Going Green. I’m enjoying watching the DVDs and I HIGHLY recommend these DVDs for South Africans that missed the show on television and are passionate about their gardens and need help learning how to do things correctly. All in all there are 19 discs available – I did not order the “Cement” DVDs because I don’t think I’m quite ready for messing around with cement at this stage. So I have 16 discs to watch and learn from. If I’m a bit scarce on the blog for the next few days … its because I’m watching the DVDs! NOTE: We are in no way affiliated with this magazine, I paid the standard price for the DVDs and they have no idea that I planned to mention this on my blog (I doubt they even know our blog exists!). Hi Chris – I finished watching 2 of the 3 DVD’s – FAB!!! very informative and the rose pruning was a big AHA moment for me!!! Now I won’t be so scared to prune my roses correctly. I do, however, need those big pruning shears that Ludwig was using!! I’ve gotten through quite a few now – must be half way. Some are very good and I’ve learnt some things and picked up a few valuable tips, but others are either of no interest to me or not that informative (to me). The one on Water Features is pretty good – I think you’ll get some good ideas off that one. Overall my impression is ok, but I actually expected a bit more. Hey Chris – that is fantastic and I’m hungry to watch them too!!! Thanks for the first 3 DVD’s you have watched already – I’m going to grab a BIG mug of coffee and watch them in peace and quiet! Chat later with my comments! The DVDs will be a great reference. Have fun. You’ll order the “cement” series next year. Sounds like a treasure! I have a greenish brown thumb, so anything help. Most of the plants and flowers I ignore do just fine.